He went for lunch at Montana and found Kimi there. He will write about the content of their meeting in a following post. great pic! 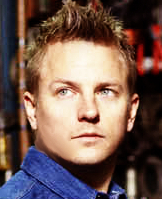 is that Kimi's overalls on the wall? 2007? last ferrari champion? i think Dina looks the best!!! He is a lazy boy Maybe he can stay longer in bed when he dont need to style his hair. Do he wear a helmet in the simulator? Maybe his hairstyle was destroyed? He does look a bit strange but I think it is just the light, and it has been a long time since we've seen him. I think he looks good in the picture with Turrini. But he looks quite happy, and he must have been in a good mood since he took a lot of friendly pictures with people. Turrini must be really happy! It´s most probably just me but somehow he does look a little bit strange?! but he looks normal to me maybe the nose looks bit different but could be the light..